Expert PDF Reader Reviews Recently Reviewed! Better than Adobe in the sense of the easier to use and much more user friendly and intuitive. Pros: Part of my job is technical writing at my software job and thus I must create many documents for distribution to my colleagues. I always save my docs as PDFs and I tell my coworkers to use Expert PDF Reader to look them over and make annotations with. It is much easier for users to use than Adobe Reader. We freely distribute it on our internal network. Cons: The only con I have is that it can sometimes be difficult to get the document laid out correctly so that it prints the same way it is shown on the monitor. It can sometime take some tweeking and moving of things around to get it just right. Overall: Expert PDF Reader has made my part-time job of technical writer much easier and simplier. I was strugling with Adobe products before, but Expert PDF Reader is much more intuitive and thus better to use. Pros: Have all the basic functions for create and edit PDF documents. Run with low use of computer resources. Pros: The user interface is easy to navigate and, for the most part, it gets the job done. Plus it is free, so no complaint there. Cons: Maybe it was a compatibility thing, but navigation can be slow and clunky at times. Feature-wise, it is also pretty basic, but it is free. I just can't think of any reason to recommend this over Acrobat Reader. 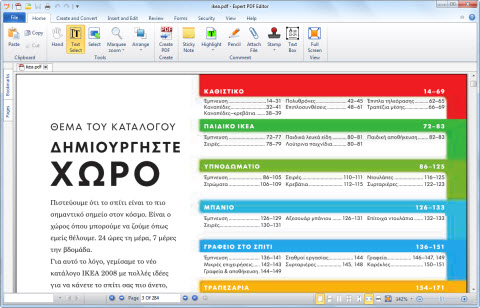 Free pdf viewer that allows you to view and print pdf documents. Pros: A big pro is that the software allows you to modify annotations and document outlines that you have created with other pdf software. Pros: The interface is easy to use, the software allows to make modifications in the annotations in the document. Cons: You can only use it in windows, so it is limitated for linux users. Also, lacks of certains characteristics of advanced programs. Pros: This software let you modify documents outlines and others annotations that you have created with others pdf reader software. This is a great advantage compared with acrobat reader or Foxit reader for example. Cons: It should have a version for Linux or Mac operating systems. A lot of people are using this kind of platform and they are not enjoying the advantages of Expert PDF Reader. Overall: This software let you modify documents outlines and others annotations that you have created with others pdf reader software. This is a great advantage compared with acrobat reader or Foxit reader for example.